Elisabetta Canalis and her calendar. Belen Rodriguez and her hard pictures. At this time, that is on top of the head of many fellow citizens. Then the singers, the young players and especially the guests! Since immemorial time, the guests are those who make the Sanremo Music Festival, isn’t it? Come on, that is trivial. They place the stars late to get a great trembling audience of fans waiting for the holy appearance; a fleeting appearance in exchange for handsome fees, forgetting of those who - among the worshipers – have a precarious job, are laid off or unemployed. But Sanremo is ever Sanremo. However, this time it is not only favorable to Robert De Niro and Take That. For a week, the people of TV freedom will be distracted by the Sanremo festival. And all the words from it will be cemented in our raped memory. 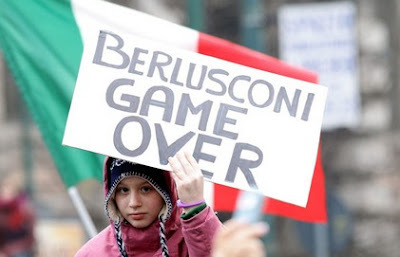 More than ever now, whoever is holding the remote on the side of the screen needs to bury the judicial Berlusconi with an ocean of words. Belen: "They can do all the manifestation they want, but women without values are not only in Italy but all over the world. It is a matter of education." Canalis: "I think the significance of the manifestation should not be highlighted or called out only on the day of the event, but there should always be." Belen: "My boyfriend (Fabrizio Corona) has already sent me flowers and will watch the festival on TV. He’s arrived here on Sunday but will return home today." Canalis: "My boyfriend (George Clooney) is committed to Ohio to shoot a feature film. I hope he will find time to see something on TV. But he will not come. I had already said in November. He sent me the good wishes but the flowers have not arrived yet. There is the time zone to consider and the day is still long." Belen: "Jealousy belongs to those who do not like it. Between us there's only healthy competition." Canalis: "There is no rivalry between us." Belen: "I am here with mom, dad, brother and sister, I am a bit anxious: because I want to prove to them my worth." Canalis: "I go to a hidden gym, but I don’t to give up shellfish and chocolate." Silvio needs a little break. The News: Morandi for Premier.